1960 Directs Britten's opera, Noye's Fludde, Vancouver International Festival. Myra Benson directs the children and John Avison conducts. 1961 Puck in Britten's A Midsummer Night's Dream, Vancouver Festival. 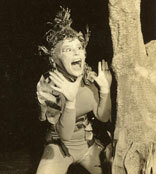 1961 Puck in A Midsummer Night's Dream, San Francisco Opera Company. 1961 Alice in The Evening Colonnade, CBC Radio Vancouver Theatre. 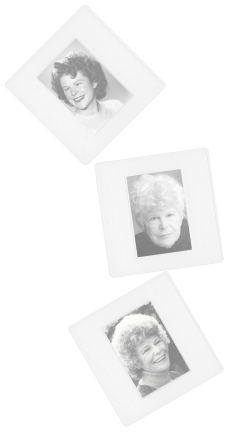 1962 Receives the Koerner Foundation grant to travel to Stratford, Ontario to study with famed voice teacher Iris Warren. 1962 Stars as Emily Carr in The Heart of the Thing, CBC Television Discovery. 1962 Mary Jacobi in The Third Day, CBC Radio Wednesday Night. 1963 Receives the Canadian Drama Award for “service to the theatre”. 1963 Receives Canada Council grant to travel to Europe to observe children's theatres. 1963 Jocasta in Sophocles's Oepidus Rex, CBC Radio Saturday Evening. 1964 Directs Henry Gheon's Christmas in the Marketplace, Playhouse Theatre, Vancouver. 1964 Alice in The Dance of Death, CBC Radio Saturday Evening. 1964 Cleopatra in Antony and Cleopatra, CBC Radio Sunday Night. 1964 Volumnia in Coriolanus, CBC Radio Saturday Evening. 1964 Clare in Friedrich Durrenmatt's The Visit, UBC's Frederic Wood Theatre. Director: Klaus Strassman. 1965 Emily Carr in The Heart of the Thing, CBC Television Camera West. 1965 Directs The Country Wife by William Wycherley, UBC's Frederic Wood Theatre. 1965 Directs The Tunnel of Love by Joseph Fields, Penticton Summer Theatre. 1965 Directs Androcles and the Lion by Aurand Harris, Holiday Theatre. 1965 Directs Ivan Turgenev's A Month in the Country, Playhouse Theatre, Vancouver. 1965 Directs William Wycherley's The Country Wife, UBC's Frederic Wood Theatre. Design by Darwin Reid Payne. Music by Bill Henderson. 1965 Agatha in The Family Reunion, CBC Radio Saturday Evening. 1966 Winnie in Samuel Beckett's Happy Days, UBC's Frederic Wood Theatre. Director: Klaus Strassman. 1966 Mrs. Castleton in Big Soft Nellie by Henry Livings, Playhouse Theatre, Vancouver. Director: Malcolm Black. 1966 Directs Clifford Odets's Awake and Sing, National Theatre School of Canada. 1967 Birth of third child, David Michael John. 1967 Becomes the Vancouver Playhouse Theatre's first woman artistic director (1967-69). 1967 Awarded certificate of merit, Canadian Confederation Centennial Committee of BC. 1967 Receives Canadian Centennial Medal. 1967 Directs George Bernard Shaw's Androcles and the Lion, Playhouse Theatre, Vancouver. 1967 Produces Premiere of George Ryga's The Ecstasy of Rita Joe, Playhouse Theatre, Vancouver. Director: George Bloomfield. 1967 Directs Britten's Noyes Fludde in Ottawa with Nicholas Goldschmidt conducting. 1968 Directs George Farquhar's The Beaux Stratagem, Playhouse Theatre, Vancouver. 1968 Directs Summer of the Seventeenth Doll by Ray Lawler, Playhouse Theatre, Vancouver. 1968 Directs Tennessee Williams' A Streetcar Named Desire, starring Frances Hyland and August Schellenberg, Playhouse Theatre, Vancouver. 1968 Establishes a second stage at the Playhouse Theatre in Vancouver for new and experimental work. Directs a new play, The Visitor by Betty Lambert, and Edward Albee's Tiny Alice. 1969 Produces George Ryga's Grass and Wild Strawberries, Playhouse Theatre, Vancouver. Original score performed live by The Chilliwack. Director: Don Ecclestone. 1969 Produces and acts in George Ryga's Ecstasy of Rita Joe. This was the only original Canadian work at the Opening Festival of the National Arts Centre in Ottawa. 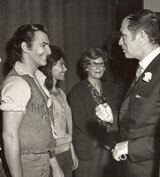 All Canadian premiers were in attendance, as was the Prime Minister, Pierre Elliott Trudeau. 1969 Receives a Canada Council travel grant for five weeks to assess new works being done in both adult and children's theatre in England. 1969 Moves to Okanagan Valley across the lake from playwright George Ryga.